Your people enjoy making calls, sending emails and giving the demos that lead to deals and commission payments. It makes sense, especially if their compensation is only set up to reward results. But this narrow incentive approach is leading to missed opportunities. Sure, rewarding anything other than a closed deal will feel odd. But good work habits and key sales activities create a steady flow of revenue — so, incentivize them. 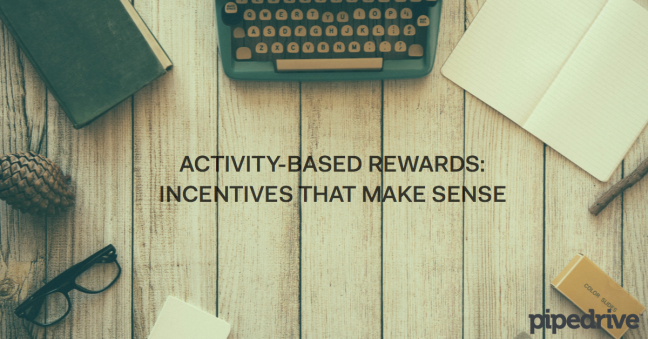 Activities-based rewards can be a powerful tool for achieving broader business objectives. Read on for advice and strategies for setting up the right incentives to meet your organization’s 2016 sales goals. First, gain consensus in your organization on which activities will help exceed business goals within a certain time frame. Then, design a tasty carrot to reward these activities. The carrot’s flavor should change based on your company’s stage of growth. It’s important to adjust both compensation and incentives as your business scales up. According to a piece he wrote recently for Harvard Business Review, Mark Roberge built a successful sales team at HubSpot by taking a data-based approach and using compensation structures keyed to each distinct phase of the startup life cycle. The goals of a new enterprise are different than those of an established company, and rewards should reflect this. Initially, incentives for Roberge’s sales team were strictly tied tightly to new customer acquisition. This meant that sales agents faced no penalty for churn — all they focused on was customer hunting, and they were rewarded for it. Later, the compensation structure reflected HubSpot’s goal of maximizing customer retention by rewarding sales agents for signing up prospects who prepaid annually instead of month to month. Roberge advises others in his position to keep incentive formulas simple, aligned with company goals and immediate. If your sales team is implementing the good behaviors you want to see, the reward should quickly materialize. Keeping a sales pipeline healthy requires unglamorous tasks. Consistently staying on top of industry trends, learning about new product features, and carefully documenting all interactions in the CRM are all part of what it takes to win. Dressler said both short-term and long-term goals should be addressed when it comes to setting up rewards. “Incentives tied to steps in the sales process encourage the right behavior to close deals and shorten the sales cycle,” he said. Closed deals are the result of diligent effort — properly qualifying prospects, making contact, conducting demos. Setting up attractive rewards along the way to favor consistent effort leads to better results, particularly for newer sales professionals who may feel like their success is beyond their control. Seeing this, Aron Ezra founded OfferCraft, a Las Vegas-based software company that allows companies to quickly create many variations of gamified experiences to incentivize desired behavior in customers and employees. An extra few days of vacation time, event tickets or gift certificates can act as a motivation engine that turns everyday activities into fun, memorable ones. Games and contests with meaningful rewards can make key sales activities more attractive to your team. “Make it enjoyable, add a whiff of competition, and hold out the possibility of big prizes,” Ezra said. “You'll find that already outcome-oriented salespeople will get far more excited about the activities you're trying to promote." Gary Smyth, co-founder of Sales Elite LLC, a sales training consultancy in Austin, Texas, suggested taking this approach a step further by using gamification and technology to integrate social responsibility within your organization. This can be achieved through rewards such as peer-to-peer recognition, volunteer days, paid sabbaticals or potlucks. By incentivizing onboarding activities, you’ll reduce the risk of losing an employee before the official start date and you’ll immediately set expectations. When activities and certain onboarding procedures are tied directly to rewards, clear measurement is important. During the training phase, new sales professionals must learn how to research prospects,properly qualify them, establish rapport, make calls and confirm meetings. By rewarding a certain number of properly qualified prospects with a bonus or a day off, for example, key sales activities will become more quickly ingrained in your new hire. To determine the types of activities or programs to implement, think about evaluating the strengths of your organization — and the places where you’d like to see improvement. Maybe your team is good at front-loading your sales pipeline with lots of cold calls or emails. But things start to fall apart on follow-up. Or perhaps your team is good at closing deals, but not outstanding when it comes to retention. It’s important to make sure your existing clients are likely to refer others to your business. If this isn’t happening, it needs to be addressed. Regularly identify strengths and weaknesses to figure out which sales behaviors and activities aren’t happening consistently. These are the areas that need incentivizing. Finally, when you home in on a set of sales activities and decide to reward them, be clear about it. Don’t be secretive about your new activities-based rewards. Open communication and incentives will increase innovation and help everyone’s bottom line. If you liked this post, check out Sales Pipeline Academy to receive actionable emails and kick-start your next sales cycle.